1. Stack and wrap the tortillas tightly in foil. 2. Bake in a preheated oven at 350F for 10 minutes or until soft. 4. Saute the onions till tender. 5. Add the beans and cook for a couple of minutes. 6. Spread some of the beans-onion filling over the bottom half of the tortillas. 7. Sprinkle 1 tblsp of cheese and fold up bottom edge and roll up from the bottom. 8. Bake them in a ungreased baking tray for 6 to 10 minutes or until heated through. 9. Serve with salsa and lettuce with the sour cream at the side. 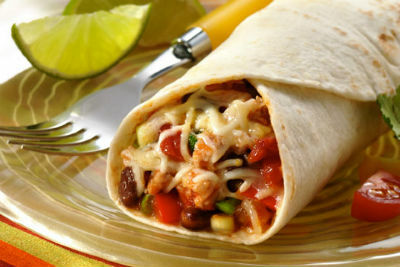 Feel free to comment or share your thoughts on this Bean and Cheese Burritos Recipe from Awesome Cuisine.